Again not my scan. Just wanna share. 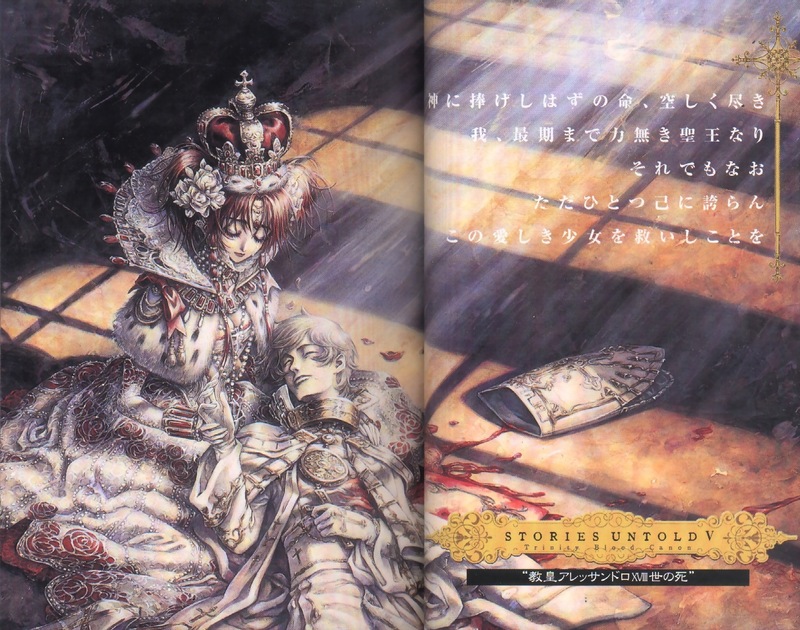 In the pic is the pic of Alessandro dying in the arms of Esther, it seems that Alessandro died protecting Esther. Ah sweet love. Hmm...a really cute couple actually. ohhhhh, i like it. thanks a lot for sharing. i think Dietrich and Esther make the hottest couple though. hahaha. just my opinion. stories untold? so it means it's not part of the novel(?) or manga? lol... this is pope ? O_____o""
Oh no its the pope, and a new dress that blood will never come off. hehe. but its sad. Love those characters and the anime,Thanks for scan! So gorgeous! But really sad! Thanks for sharing. awww...a sad scene...but still beautiful..tnx !